As Public Employee Recognition Week concludes, I want to take the opportunity to emphasize a common theme we’ve enjoyed this week – the investment each of you make in the transportation system, your professions and your colleagues. 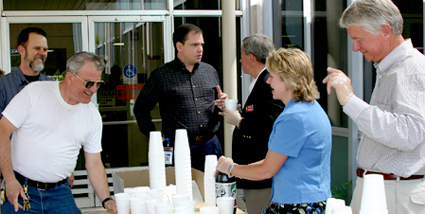 including rootbeer floats prepared by members of executive management. I am sending my best wishes to you for Public Service Employees Recognition Week and for State Employee Recognition Day, May 4th, 2004. It is important for all Idaho citizens to recognize the work each of you performs on a daily basis to keep our great state working. There’s nothing like a full plate of projects and the promise of re-engineering transportation throughout Idaho to provide motivation. Steve Hutchinson, recently appointed ITD's Chief Engineer, has been intimately involved in the program planning of the governor’s Connecting Idaho initiative. He and the Division of Highways will be responsible for turning new funding options (GARVEE bonding authority) into additional lane miles, interchanges and bridges. ITD claimed four first-place awards and an equal number of third places in the Public Relations division of the annual Idaho Press Club annual awards last week. The 2004 awards presentation Saturday (April 30) included a capacity crowd of print and electronic media and public relations representatives at the Owyhee Plaza in Boise. More than 80 participants and observers recently studied at Idaho’s transportation needs during the third meeting of the Forum on Transportation Investment (FTI), an all-day session at the Red Lion Hotel in Pocatello. Successful public involvement is based on receiving as well as giving information. That philosophy has been the guiding principle of the award-winning public involvement campaign for the U.S. 95 Thorncreek to Moscow project in District 2. The project team for the controversial project is providing a wide range of opportunities for public input. “There is a dark cloud looming that will needlessly delay many important highway and transportation projects around the country and force consumers to pay more at the pump at exactly the worst possible time,” U.S. Department of Transportation Director Norman Y. Mineta said Thursday (May 5).